Muscle atrophy, or muscle loss, is the wasting away of your dog’s muscles. It can present in a number of ways and can be caused by ageing, illness or simply by reduced activity. Larger breeds can be more likely to suffer as they can age faster than small breeds, and are more prone to conditions like arthritis, but muscle atrophy can affect any dog. Have your dog’s muscles got thinner? When a muscle loses mass it will look noticeably thinner – for example your hand might reach all the way round your dog’s leg when it didn’t before. Dogs that lose muscle mass will usually lose weight too and you may notice that your dog feels lighter when you pick it up. Try weighing your dog to see if it has lost any weight. Regular weigh-ins can be a good idea if you are concerned about weight loss. 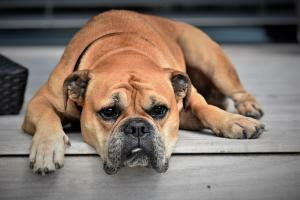 Have you noticed any muscle weakness in your dog? For example your dog’s back legs may be unable to support its weight and you may notice that your dog is favouring the front legs. Is your dog getting flabby or feel less firm? Flabby muscles on your dog may indicate muscle loss. Strong muscles feel firmer, so if your dog feels softer it may be because of muscle loss. Muscle loss makes it more difficult to move about and a dog with muscle atrophy may also be suffering with painful joints, a lack of energy or an underlying condition that needs to be addressed. Is your dog dragging its paws or crossing the legs? Or have you noticed a sagging back? The muscles work with the bones to help the body stay upright and a loss in muscle mass makes it more difficult to support the body. Therefore if you notice a change in posture it could be down to muscle loss. Muscle atrophy can be symptomatic of a number of underlying conditions and if you do notice any of these symptoms the first step is to see your vet. This is vital so that the problem can be properly diagnosed and treated. If your dog is suffering from muscle atrophy due to ageing or from disuse you can help them by maintaining a healthy exercise program. Even older dogs can still benefit from a daily walk as long as you pay attention to your dog’s signals and don’t overdo it. Again, talk to your vet before embarking on a new exercise regime for your senior dog. The right diet is also vital for maintaining healthy muscles and joints for your dog. Make sure you are providing a good quality feed and following any guidelines with respect to your dog’s age, breed and lifestyle. Nutritional supplements like Joint Aid for Dogs + Muscle Maintenance can also be very beneficial in these circumstances to support the natural regeneration of muscle, cartilage and synovial fluid.